THE STORY - Adonis Johnson (Michael B. Jordan) never knew his famous father, boxing champion Apollo Creed, who died before Adonis was born. However, boxing is in his blood, so he seeks out Rocky Balboa (Sylvester Stallone) and asks the retired champ to be his trainer. Rocky sees much of Apollo in Adonis, and agrees to mentor him, even as he battles an opponent deadlier than any in the ring. With Rocky's help, Adonis soon gets a title shot, but whether he has the true heart of a fighter remains to be seen. THE GOOD - This movie hits every note in just the right way. Connecting to the earlier Rocky films without being overly sentimental, incredible boxing action, raw emotion, and more, “Creed” is a winner in every way. THE BAD - Honestly nothing worth noting. Adonis Creed was born into nothing, but he had greatness in his blood. Michael B. Jordan stars in Ryan Coogler’s “Creed,” as the son of famous boxer Apollo Creed. This is the seventh film in the “Rocky” franchise, but it feels as fresh as ever. It’s not just another boxing film. It’s a story of a man desperate to make a name for himself, to be someone. Director Ryan Coogler's second film ("Fruitvale Station") is full of life, energy, and raw emotion. Born in secret due to his father’s affair and death, Donnie bounced in and out of juvenile detention and foster care. Eventually, Apollo Creed’s wife Mary Anne (Phylicia Rashad) adopts Donnie. He grows up never reconciling his abandonment with who his father was. He wants to be a legend like his father but wants to make it on his own. He uses the last name Johnson, his mother’s name so that no one finds out who his father was. Sylvester Stallone has been playing Rocky for over forty years now, but he’s never been this fully realized as a character. When Donnie moves to Philly to get away from his past, he convinces the aging Rocky to help train him. The chemistry between the two actors is real as real as any on-screen pairing in the history of cinema. They have this kindred connection, and it’s beautiful to watch their relationship develop as the film progresses. Rocky knows there’s something special in Donnie, but he’s hesitant to fully train him. The film moves with effortless confidence. Maryse Alberti’s gorgeous cinematography is gritty and realistic, with a stunning gray and black palette. It’s filled with long takes that immerse you in the realism of the world. Donnie’s first fight in Philly is filmed in an unbroken sequence, with the camera floating to-and-fro amidst the action. It’s one of the best boxing sequences in cinematic history. The choreography is absolutely stunning to watch as the intensity is unbroken, allowing you to feel the weight of each punch and jab. Every performance in "Creed" feels so genuine under the direction of Ryan Coogler. Michael B. Jordan inhabits the role of Adonis Creed perfectly. He’s full of confidence and swagger when in the ring, but vulnerability and passion outside of it, especially when he's with his girlfriend Bianca, played by Tessa Thompson. She kills it as Bianca, the up-and-coming singer who keeps Donnie's focus and heart in the right place. For as great as everyone else is, the best performance, however, belongs to Sylvester Stallone. This is the first time we’ve seen Rocky, but not as a fighter. He’s older, he’s slowing down, and he’s alone. There’s one scene where Rocky is confronted with horrible news and the subtlety of his emotions is unlike anything we’ve seen from Stallone before. He has a single line that wrecks me every time. The accolades he received for this performance were totally warranted as "Creed" stands as the best performance in the legendary actor's career. As news gets out about who Donnie truly is, he’s offered a massive fight against “Pretty” Ricky Conlan, a brutal British boxer, and thus a shot at the light heavyweight championship. They take the fight on the condition that Donnie fights under the Creed name. He’s avoided it for many reasons. He resents his father for dying before Donnie was born, but he also wants to be everything his father was. Most of all, he’s afraid of not living up to the name. 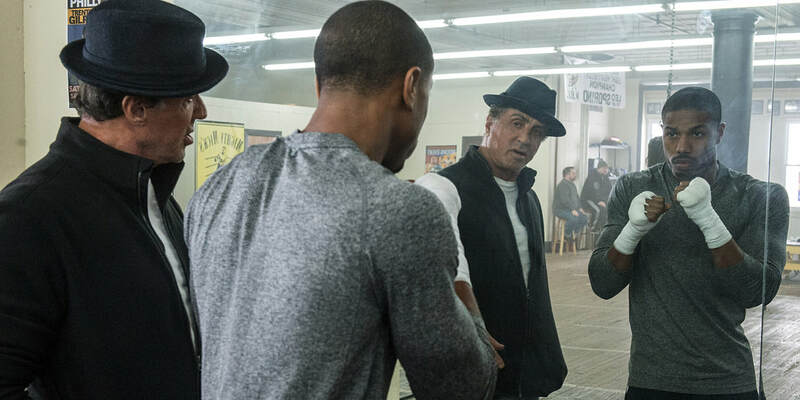 Donnie snaps every time he’s called “Fake Creed” or “Baby Creed.” Fighting as Adonis Creed, he has to face what it means to be his father’s son. That identity crisis is what gives "Creed" its heft and elevates it above the standard "boxing movie" or "just another Rocky sequel." One of the best things about “Creed” is that it rarely feels like a sequel. Every callback to the previous films feels so natural that you’re never pulled out of the story. It simply exists in this universe, rather than being full of easter eggs. Ludwig Göransson’s masterful, percussive score feels new and effective while calling back to Bill Conti’s classic “Rocky” theme. It stands out best during Donnie’s training montage, as he runs down the streets of Philly.